pAsuram 61 (main pAsuram of this prabandham). mAnilaththeer – Oh those in this big earth! vaikuntham – SrI vaikuNtam (to you). Now, he (maNavALa mAmunigaL) divines that just by the relationship with one’s AchAryan, thAyAr’s husband sarvESvaran himself would give SrIvaikuNtam – explained in this pAsuram ‘gyAnam anuttAnam’, etc. gyAnam – is – knowledge related to grasp of what is the means, and haste in the matter of goal. anuttAnam – is – having conduct according to that (knowledge), conduct in the matter of means and goal, as said in ‘alarmEl mangai uRai mArbA – un adikkeezh amarndhu pugundhEnE [thiruvAimozhi 6.10.10]’ (~ Oh emperumAn in whose chest resides thAyAr who is from lotus flower – have set myself well under the shadow of your divine feet), and in ‘vazhuvilA adimai seyya vENdum [thiruvAimozhi 3.3.1]’ (shall perform unblemished services), and in ‘nAyEn vandhu adaindhEn nalgi AL ennaik koNdu aruLE [periya thirumozhi 1.9.1]’ (I being a lowly one like a dog, I came and surrendered to you, please grace me and accept as your servant). This is what is said in dhvaya mahAmanthram. So, it is divining here that an AchAryan who is steadfast in dhvayam which is of 6 words, is the one to surrender to. This is as said in ‘ivanukkAgath thAn upAyAnushtAnam paNNi rakshikkavalla mahA bhAgavathan’ (Great devotee who can protect the Sishya (disciple) by observing emperumAn as the means on behalf of him). ivai – (these) – As said in ‘ivaiyanRE nalla ivaiyanRE theeya ivaiyenRivai aRivanElum [periya thiruvanthAdhi – 3] (I know that these are good, and these are bad), using that knowledge which can distinguish between good and bad deeds, rid of those to be ridden, acquire those to be acquired – conduct in such form. AchAryas divined ‘AchAryanukku adaiyALam aRivum anushtAnamum’ (AchAryan is identified by knowledge and conduct); they also refer to these two in ‘vilakshaNarudaiya gyAnAnushtanangaLil vAnchaiyum [Sri vachana bhUshaNam – 243]’ (having love towards the ways of knowledge and matching conduct of distinguished ones). nanRAgavE udaiyanAna guruvai – By surrendering only to such AchAryan who is complete in the aforementioned (knowledge and conduct), and is established well in sathva guNam (purity of goodness / tranquility), would one be able to reach the true goal. Even if there is one of them (knowledge, conduct) lacking (in AchAryan), he who surrenders would not get the benefit of such surrender. In the place that is surrounded by forest fire, if there are blind and lame for each other, it would be useless. It is only by someone having both eyes and legs would it be possible to escape and survive such a place. So knowledge with less conduct, or conduct with less knowledge is useless. Starting with ‘gyAnaheenam gurum prApya … yadhA pAram na gachchathi [anthimOpAya nishtai – page 5] (going to a guru who does not have knowledge … have not reached the other shore’), is what it says. Only if one has got both eyes and legs would he be able to help someone reach the shore. It is as said in ‘andhO anandha grahaNa vasaga: [nyAsa thilakam – 21]’ (a blind shall go with the help of one having eyes), etc. AchAnpiLLai too divined, ‘thannai akkarai ERRavalla gyAnam mudhalAnavai muzhumaiyAga niRaindhavanAyiruppAn oruvan’ (the unique person who is complete in gyAnam etc., the one who can get you to the shore). So, one should take refuge of such AchAryan who is having unblemished knowledge and matching conduct. guruvai adaindhakkAl – As said in ‘gururEva param brahma [SrI sAthvika thanthram dhvya prakaraNam]’ (guru is the top most god), and in ‘peethakavAdaip pirAnAr pirama guruvAgi vandhu [periyAzhvAr thirumozhi 5.2.8]’ (emperumAn who is wearing yellow garments came as AchAryan (and sat in my heart and removed the blemishes)), if one surrenders to the best among the gurus. If this unobtainable is obtained, then by the greatness due to surrendering (rAja kula mAhAthmyam), emperumAn will bestow the ultimate goal of eternal kainkaryam. adaindhakkAl mAnilaththeer – As said in ‘yE cha vaishNava samSrayA: [chaNdilya smruthi – 1.15]’ (they who have surrendered to vaishNavas..), when having internal disposition of AchAryan’s love. I am only asking you to use the means that is even simpler than prapaththi. If asked – but if we reached AchAryan as you said, what would happen? 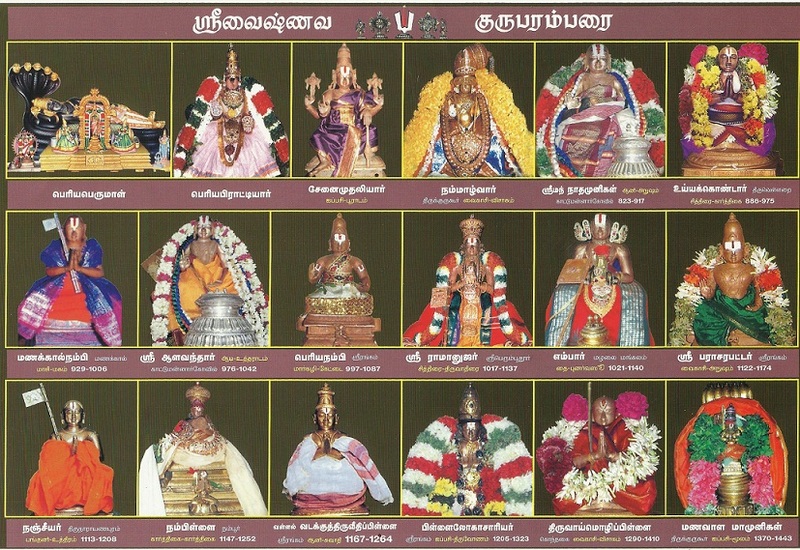 As said in ‘thirumAl vandhu en nenju niRaiyap pugundhAn [thiruvAimozhi 10.8.1]’ (emperumAn came and fully occupied my heart), and in ‘aravindhap pAvaiyum thAnum agampadi vandhu pugundhu [periyAzhvAr thirumozhi 5.2.10]’ (He and thAyAr who is from lotus flower, came and sat in my heart), since He comes into his heart as a best seat as said in ‘en uLLam mAlukkidam’ (my mind is the place for emperumAn), we can say He Himself (would give it). It is divined, ‘AchAryanaip paRRugai kAlaip pidiththuk kAriyam koLLumOpAdhi [SrI vachana bhUshaNam – 427]’ (surrendering to AchAryan is like achieving our wish from someone by holding on to their feet (which means our wish would be surely fulfilled)). Due to this kind of means which never leaves us, and which cannot be ignored (by Him), emperumAn who is the husband of thAyar who is said as ‘thEnAr malar mEl mangai [periyAzhvAr thirumozhi 1.4.7]’ (periyA pirAttiyAr who is on the lotus flower that is full of honey), for those following the way of having AchArya abhimAnam (love by/towards AchAryan), with Her blessings, He would give us the destiny for Her happiness. for the happiness in Her face, just based on the connection, He would be all over us to give SrivaikuNtam. thenAr kamalath thirumAmgaL kozhunan – Since periya pirAttiyAr (SrI mahAlakshmi) who is having her place as the lotus flower which due to Her connection is full of honey, She who is having the name of SrI, subjugates (attracts and gets under control) her husband emperumAn and makes them reach true goal, them who who have surrendered to AchAryan whose nature is to connect us to emperumAn through to Her connection; so for her love, He takes the role of giving mOksham himself, as said in ‘aham mOkshayishyAmi’ (SrI bhagavath gIthA – 18.66) (I give the benefit of SrIvaikuNtam). thirumAmagaL kozhunan thAnE – Would give the ultimate experience of SrIvaikuNtam that is said as ‘thirumAl vaikuntham [thiruvAimozhi 10.7.8]’ (SrIvaikuNtam of emperumAn). vaikuntham tharum – As said in ‘veedum tharum [thiruvAimozhi 3.9.9]’ (would divine the pleasure of SrIvaikuNtam), will give the opportunity to live with interest in doing eternal services in the togetherness of emperumAn and thAyAr. This pAsuram is the life/heart of this prabhandham (uyir pAttu). So by this, it has conveyed the meaning the ‘AchArya abhimAnamE uththArakam [SrI vachana bhUshaNam 447]’ (AchAryan’s love towards us is the only shelter). This entry was posted in Other, upadhESa raththina mAlai and tagged 74, annan, anushtanam, erumbi, erumbiappa, guru, gyanam, kovil, main, mamunigal, manavala, pasuram, pasurams, rathina, rathinamalai, raththina, raththinamalai, thane, upadesa, upadhesa, vaikundham on February 2, 2016 by raghuram.